When using the snow sweeper you can remove snow falls completely and to a depth of 15 cm. Our outdoor products (Park Ranger 2150 / City Ranger 2250) are now owned by Egholm A/S. Egholm A/S is in the process of making a new website and webshop. In the meantime the product information will remain on our website. If you need more information, please contact Egholm A/S directly: info@egholm.dk. The City Ranger 3500 and City Ranger 3570 are still owned by Nilfisk. The snow sweeper is perfect when used with the first snow fall of winter. It can completely remove snow to a depth of 15 cm – even when the terrain is uneven, keeping paths clear and dry. The snow sweeper is centred and attached onto the front of the utility machine. It has a full working width of 1,220 mm. 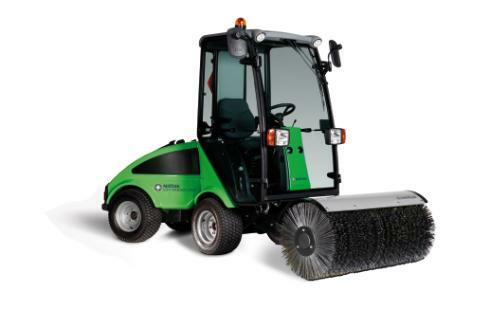 It can sweep right into walls and bases without damaging the machine or building – and of course it can be combined with a salt and sand spreader attached on the back, so that areas being swept can simultaneously be made safe and passable. Two jobs done at once. Twice as effective. The operator has full visibility, making driving and manoeuvring easy. The snow sweeper is designed with an integrated supporting strut. The support strut protects the snow sweeper when it is stored and makes it easy to move. Effective protection extends the lifetime of any tool. When you change attachments, the City Ranger 2250 hydraulic hoses are connected at the turn of a handle!